Apple’s release of iOS 4 on Monday grabbed most of the attention, but it wasn’t the only iPhone-centric product to come out of Cupertino that day. The company also released iBooks 1.1, a universal app that brings Apple’s formerly-iPad-only take on e-reading to the iPhone. I spent some time with the iPhone version of iBooks, both perusing the aisles of its virtual iBookstore and doing some light reading on my iPhone. 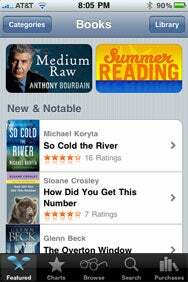 Here are some first impressions about using the iPhone version, how it differs from iBooks on the iPad, and how it measures up to other mobile reading apps. You can only browse the iBookstore in portrait mode on your iPhone. And the iPhone version doesn’t show you prices until you drill down into the book listing. If you’re an iPad owner who’s already downloaded books from the iBookstore, don’t panic when you first launch the updated app—even though your bookshelves will look as barren as Joan Rivers. There’s a way to get those books back, and it’s easy. In fact, the button to tap is the same one you need if you’ve never purchased a book from Apple: Touch the Store button, and the bookshelf flips around like a secret passageway, revealing the iBookstore’s main interface. Tap the store’s Purchases tab to re-download books you’ve already bought. You can only restore those books one at a time—a tad annoying if you’ve used iBooks to stock up on lots of e-books since the iPad’s debut. For some reason—I’m thinking a sadistic designer—the Store and Edit buttons flip sides between the iPhone and iPad version of the iBooks app; tappers beware. While Apple lets you buy music and apps from your computer or your iOS device, currently your only option for browsing the iBookstore is via your iPhone or iPad. Annoyingly—and unlike the iPad version of the store—the iPhone doesn’t show book prices while you browse the virtual shelves; they’re only revealed when you tap into the book listing itself. Beyond browsing those books Apple chooses to feature, you can also browse by category and view bestsellers. Since iBooks now offers syncing, you can download the same book to your iPhone and iPad (paying for it only once), and the app will seamlessly make sure you’re always on the right page. That way, if you take in a page or two of Sarah Silverman’s The Bedwetter with your iPhone while standing in line at the grocery store, your iPad will let you continue reading just from where you left off. Once you’ve downloaded a few books to your iPhone, the search bar atop your bookshelf makes it easy to find just the title you’re looking for. 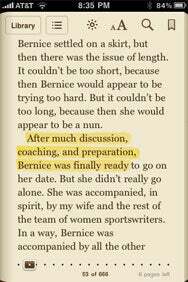 You can highlight text in iBooks. And tapping on the text of your books makes those interface buttons disappear. When you first start reading a book, the screen is rather distractingly adorned with no fewer than nine interface elements that surround the text—a button to return to your library, a shortcut to the table of contents, a means of adjusting the font size and style, and so on. Tapping anywhere on the text itself removes most of the cruft and clutter, which is frankly too much information to cram onto the iPhone’s tiny screen. Still, it’s nice to have those buttons just another single tap away. You can bump the font size up so that it’s almost comically huge, toggle between a sepia-toned background or the default white one, search the book’s text, or add bookmarks with ease. In an advantage over the Kindle, the Nook, and those devices’ corresponding iOS apps, iBooks can show you how many pages remain within the current chapter. It’s a great feature for anyone who’s ever needed to make that judgment call regarding how many more pages to read before it’s time to close the book for now. You can tap and hold on text within iBooks to get a definition or mark the text. (Note that the first time you need a definition, the app will need to download Apple’s dictionary, which takes a minute or two.) Definitions live on their own screen; tap Done to return to your book’s text. You can also add notes and highlights—the latter in multiple colors—and then revisit those notes and highlights again using the Table of Contents. 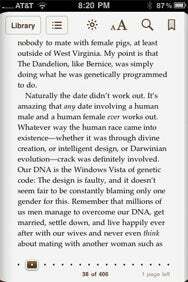 iBooks lets you read in portrait or landscape mode, which works nicely with iOS 4.0’s new software-based orientation lock. (Of course, since you can only lock the iPhone in portrait, this feature really only works great if that’s your preference.) The iBookstore interface works solely in portrait mode. For the most part, landscape reading feels like a bit of an afterthought on the iPhone. In the bottom right corner of the screen, iBooks tells you how many pages are left before the end of a chapter. With the launch of iBooks for iPhone, Apple has taken time to improve upon the app’s text presentation from its original iPad incarnation. The Georgia font has been added, and it looks very good on the iPhone’s screen. Additionally, you can now disable right-justified text, which is an even more welcome change (though annoyingly, accessible only within the Settings app). Justified text on a screen the iPhone’s size requires often-ridiculous word spacing when hyphenation isn’t available, and indeed iBooks doesn’t hyphenate. The app also includes a brightness slider so you can change the brightness of the iPhone’s backlight without switching to the Settings app. I actually prefer the brightness mechanism that the Kindle and BN eReader apps offer for nighttime reading, which leaves the backlight alone but adjusts the contrast of the text and the page. iBooks also doesn’t offer a white-on-black mode, which is often preferable in very dark conditions. Apple remains right in the thick of the fast-developing, increasingly cutthroat e-reading world, and iBooks for iPhone offers decent feature parity with the apps from Kindle and Barnes & Noble. Each of the apps is very good, and each has weak spots, too. Whether the e-reading app war will be won on features alone, or whether book pricing and selection will play a larger role, is a story whose conclusion hasn’t yet been written. We'll have a full review of iBooks in both its iPhone and iPad incarnations soon.